Last week, the lucky residents of District 5 in Arcadia were gifted with a satirical treat from the opposition to Roger Chandler. This piece of marketing genius capitalized on the familiar and popular Monopoly brand and transfixed the reader into a new quantitative reason for NOT voting for community backstabber Roger Chandler. Not only do we get to chuckle at all the quirky quips modeled after the original board game, but we have real, hard facts, irrefutable evidence of the voting history of the candidate begging for re-election. It seems Chandler's actions speak louder than words. He's a sell out, plain and clear. A whole committee was formed just to oppose Roger Chandler in this election, and it seems to be fronted by a real person who lives and votes in the area where Roger is running. Congratulations to the people who fight back against the demagogues and their mysteriously funded war chests. 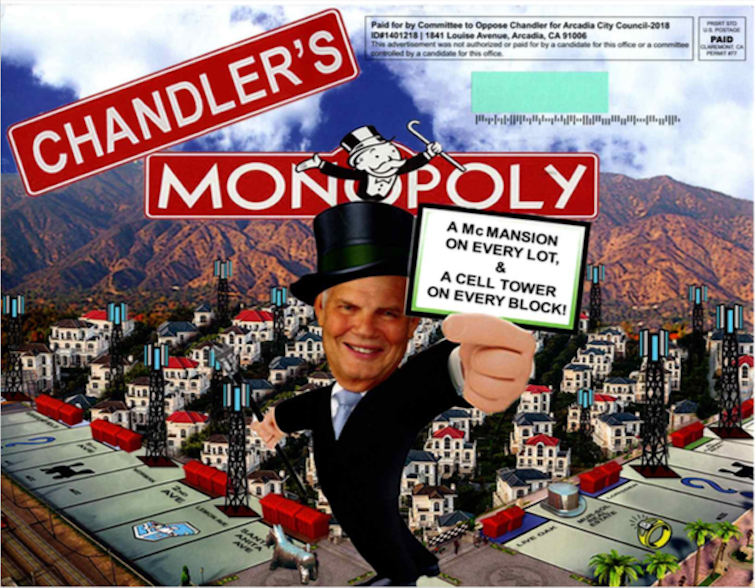 Hopefully, District 5 residents are now getting the message that Chandler cares more about the profits of developers than quality of life for the residents. Chandler's biggest lie is that limits on building will cause property values to collapse. That certainly didn't happen in Sierra Madre, and it didn't happen in Arcadia, either. Sierra Madre has proven time and again that preservation and reasonable building codes protects the property values of the residents. Those houses that sit next to these oversized mausoleum-looking monstrosities lose their privacy, their views, sunlight and, of course, big chunks of their property value. Preservation has worked in Sierra Madre, San Marino, Monrovia, Pasadena and just about every other city in the San Gabriel Valley. Why the people of Arcadia keep electing those pro-development sell-outs, well, I will never understand that. It's like paying for the rope they'll hang you with. 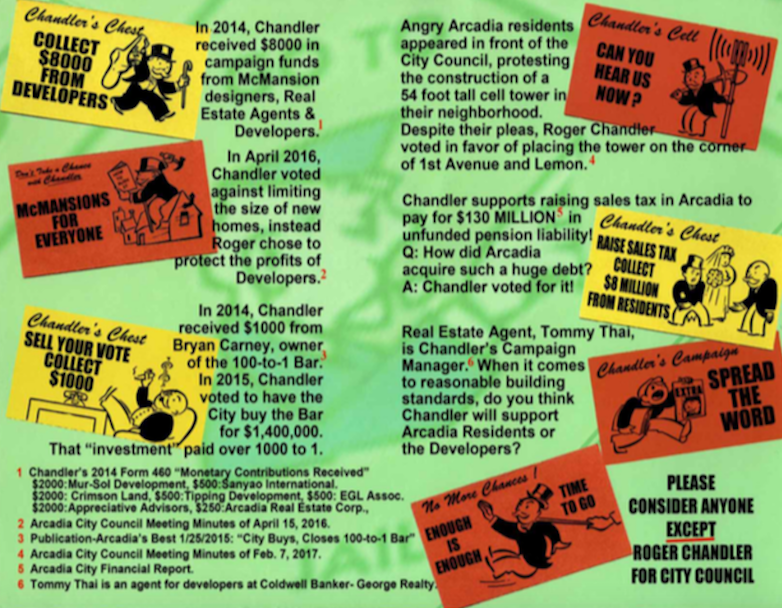 So what can Roger Chandler take credit for during his 30+ years on Arcadia’s City Council? - The Mansionization of Arcadia. - $130 million unfunded pension liability. What can Arcadia have to look forward to if Chandler is re-elected? - Votes to revoke the codes limiting the size of new homes. - Votes to revoke tree preservation. - Votes for cell towers in residential neighborhoods. - Votes for raises to the police and fire which will balloon taxes and still end up bankrupting the City of Arcadia. Dump the chump. Save the town. Harbicht needs a Go To Jail card for breaking campaign laws. ROGER CHANDLER IS NO SELL OUT HE HAS ALWAYS MADE SURE ARCADIA IS ONE OF THE MOST SAFEST CITY IN SGV. AND IF PEOPLE REALLY TOOK THE TIME. TO LOOK INTO THE FACTS THEY WOULD KNOW HE IS THE ONLY ONE RIGHT FOR THE JOB. ROGER HAS BEEN DOING GOOD THINGS FOR ARCADIA FOR YEARS AND IF YOU DONT RECALL WHAT THEY ARE YOUR A NEWBIE.AND SHOULD SHUT UP . Who is running against Chandler? Joyce Platt and Jolly Wu. Either one would be a huge upgrade. Jolly Wu is smart, energetic and humble. She is funding her campaign herself, without any monies from anyone else. Vote for Jolly Wu District 5. She will make a difference! Agree. Vote for Jolly Wu District 5. Unlike the other candidates, she is the only person who put her money where her mouth is. I know Jolly will fight for me and my community in District 5. Please help to spread the word to vote for Jolly Wu. Why are you so sure this could not happen in Sierra Madre? Sacramento is demanding the redesign of cities and the Planning Commission and City Council members have their hands tied, regardless of who sits on the City Council. Yep. Developer money talks in Sacramento, too. I don't recall any Sacramento legislation that says you need to allow for 8,000 square foot vanity castles. SB 827-Transit Rich Housing Bonus would dictate height and density of residential development within 1/2 mile of train stations and within 1/4 mile of bus stops. Typical Sacramento BS. Build a bunch of stack & pack units next to a bus stop and magically everyone starts taking the bus. The reality is you end up with a whole lot more cars in town. Chandler and Harbicht together would run Arcadia into the ground. They are both endorsed by the APOA, because the APOA knows this duo will ensure a lifetime of raises and benefits with no concern of the city’s budget. Their attitude: if there isn’t enough money in the city’s budget, then just raise taxes. Mutual bribery. And the logic is just bizarre. Crime has gone up, so give us more money and maybe then we'll fix it. Anybody notice that in the background of the second graphic it says "Go To Jail" ? 7:27am. Are you speaking about Arcadia or Sierra Madre when you say "they" raise taxes? Both cities have huge pension obligations, way beyond their ability to pay now. The old boys gave away the farm. Chandler and Harbicht are no different from Buchanan and Mosca. So yeah, both. Measure UUT was just a step up the ladder. After this election more steps will be announced. They have no choice. The poison is already in the system. Instead of raising sales taxes or UUT, City Hall needs to downsize and cut staffs. Most city staffs are slackers gets guarantee salary rate and benefits positions protected by employee bargaining unit agreements. Only about 10% staffs take their jobs seriously and professionally. Unfortunately if laid off, most slackers cannot compete nor survive in private sector jobs. So no choice but to keep demanding that paychecks be turned over at City hall. Hmm, sounds like something's not right here. Will Sacramento be supplying the tents for everyone to live in when the money just ain't there anymore? Can't fight the poison in the system? Sounds like a spending problem and there are choices to be made about that. The police extort money from cities, threatening to trash talk any city that dares to refuse to meet their demands. Does anyone remember those billboards from Monrovia police that said “Caution: You Are Approaching Monrovia. Higher Violent Crime. Fewer Police Patrolling” when Monrovia City Council tried to keep raises and benefits in check. Sacramento has declared this state as Santuary status, so the narrative of 8,000 vanity Castles works! SB 827. Does it give additional bonuses to developers because of less parking spaces? Residents that LEASE living on the Metro line living space do so for ease of commuter rail transportation, or so the planners say. Superimposed photos on campaign mailers are illegal in California unless they contain a disclaimer that says "This picture is not an accurate representation of fact.". This mailer does not have the required disclaimer so it is possibly illegal. (a) Except as provided in subdivision (b), no person, firm, association, corporation, campaign committee, or organization may, with actual malice, produce, distribute, publish, or broadcast campaign material that contains (1) a picture or photograph of a person or persons into which the image of a candidate for public office is superimposed or (2) a picture or photograph of a candidate for public office into which the image of another person or persons is superimposed. “Campaign material” includes, but is not limited to, any printed matter, advertisement in a newspaper or other periodical, television commercial, or computer image. For purposes of this section, “actual malice” means the knowledge that the image of a person has been superimposed on a picture or photograph to create a false representation, or a reckless disregard of whether or not the image of a person has been superimposed on a picture or photograph to create a false representation. (b) A person, firm, association, corporation, campaign committee, or organization may produce, distribute, publish, or broadcast campaign material that contains a picture or photograph prohibited by subdivision (a) only if each picture or photograph in the campaign material includes the following statement in the same point size type as the largest point size type used elsewhere in the campaign material: “This picture is not an accurate representation of fact.” The statement shall be immediately adjacent to each picture or photograph prohibited by subdivision (a). (c)(1) Any registered voter may seek a temporary restraining order and an injunction prohibiting the publication, distribution, or broadcasting of any campaign material in violation of this section. Upon filing a petition under this section, the plaintiff may obtain a temporary restraining order in accordance with Section 527 of the Code of Civil Procedure . (2) A candidate for public office whose likeness appears in a picture or photograph prohibited by subdivision (a) may bring a civil action against any person, firm, association, corporation, campaign committee, or organization that produced, distributed, published, or broadcast the picture or photograph prohibited by subdivision (a). The court may award damages in an amount equal to the cost of producing, distributing, publishing, or broadcasting the campaign material that violated this section, in addition to reasonable attorney's fees and costs. (d)(1) This act shall not apply to a holder of a license granted pursuant to the federal Communications Act of 1934 ( 47 U.S.C. Sec. 151 et seq. ) in the performance of the functions for which the license is granted. (2) This act shall not apply to the publisher or an employee of a newspaper, magazine, or other periodical that is published on a regular basis for any material published in that newspaper, magazine, or other periodical. For purposes of this subdivision, a “newspaper, magazine, or other periodical that is published on a regular basis” shall not include any newspaper, magazine, or other periodical that has as its primary purpose the publication of campaign advertising or communication, as defined by Section 304 . Blah blah blah. The problem in this campaign isn't finding the illegal tactics, it's finding the legal ones. Go crap in your hat, councilor. Better make it a big hat. You can always tell when something has really hit home. The lawyers come out. I think 8:56 has been standing too close to a cell tower. The key term is “possibly illegal”. It is my opinion this law has clearly not been violated. The law refers to superimposing images onto REAL persons, not caricatures. Everyone can tell from the graphic the body is not a real person. No need to disclaim it’s not a real person. This law was intended to prevent the use of images of candidates superimposed on another’s body committing some sort of transgression or illegal act, for example, superimposing the face of a candidate onto the driver of a vehicle running from the police, making it look like the candidate was caught trying to run from police, or doing some other unsavory act. 8:56 must think he was being all scary and stuff. 8:56am. English Lady is this you? You have gone from correcting others to now scanning rules. This brilliant flyer will become a collector's item. I teasure mine both front and back. Many chuckles but sad that it has been proven by evidence to be true. It is a sharp knife slicing down to the truth. Tay, Chandler, and Harbicht are puppets dangling from the strings of their special interest/developer puppet masters. Arcadia has the chance to boot them out of town by voting for Beck, Wu, or Platt. The genius behind this creative flyer should approach Hasbro who owns the Monopoly Game to make a customized version of the Monopoly Game Board "Arcadia Style Monopoly" here politicians are controlled by puppet master developers. Just give me a small cut for my suggestion. Does anyone remember two weeks ago "The Tattler was treated like a celebrity" in the March 6 Arcadia City Council meeting? The Tattler was mentioned a few times by many speakers during public comment session (ref: 3/12/18 The Tattler article: The Arcadia City Council Election Process). I encourage those who reads and cares about true and accurate news reporting by The Tattler should come to the Arcadia City Council Meeting tonight at 7PM to express your views. For those who wants to make public comment, please fill out a speaker card right next to the entry door and give it to the City Clerk Gene Glasco. Let's rally behind The Tattler tonight at 7pm at the Arcadia city council chamber located at 240 W. Huntington Dr., Arcadia. The chamber building is right across the city hall building. Have your friends and family all come to support our true news! Thanks! I'm all a-blush. Obviously the fine graphics in today's post have captured the imagination of Arcadia voters. The traffic numbers are pretty healthy. Very Monty Pythonesque responses to 8:56's baloney this morning. Thanks for the laughs! "Always look on the bright side of Life..da da, da da, da da da da dee da"
Maybe Tay, Chandler, and Harbicht will, like the horrible Grinch Who Robbed Christmas, come to their senses and make peace with the Village? Nah! Never! Ain't gonna happen! In your dreams! If you are going to use childish references, at least try to get them right...the Grinch "stole" Christmas. The real crook here is Tom Beck. He lies about his real agenda. He wants smaller houses for the common folks but lives in a 7000 sq foot home himself. He claimes to be fiscally responsible but he, along with his pal April Verlato, keep getting the City wrapped up in law suits we can't win from pure petulance and the firm conviction they are smarter than everyone else. Time to put an end to the Beck/Verlato show. They are an embarrassment. Beck out now, Verlato out next election. You need to get one of those millionaire cops to take you to a drunk tank and dry out. 4:07 is having a dream. Sadly, it is all he has left. Robbery works better for Arcadia. However, look to Jerry's kids for the reason. Chandler is going to hit them with his walker. Don't you get it? Robbery is a felony and deserves a Monopoly GO TO JAIL card. Just keeping with the "theme". I'll take "Becker" over Beck any day. I sure hope Tommy boy got the message last night. He is not looked upon favorably by Arcadia residents. He tells half truths sometimes and lies outright other times. He had no defense for the comments made about his claims of support of the police, his massive house (but you can't build one) or his support of bad ideas and frivolous law suits. Whoever fed the speech to the man that got up and tried to slam Sho Tay about being appointed, needs to pick a better mouthpiece. If he wrote that speech, I'm Mickey Mouse! I think the message was that Beck is not viewed favorably by the handful of poorly informed individuals Sho Tay talked into coming down to last night's city council meeting to display their confusion in front of the entire city. Sho Tay should be prosecuted for resident abuse. Yo. 4:07, what exact lawsuits did Verlato and Back bring on the city ? Do you know anything about Arcadia? Coyote trapping...sued. Let's trap and kill coyotes! Dumb. Cell tower....sued. We don't want a cell tower so we'll fight it. Now we're gonna have 28 small ones. Circular driveway...sued. "I don't like circular driveways." Tom Beck...Seriously? Cities get sued all the time, whiny pants. But look, wasn't the Chandy Man on the City Council when all of this was happening? Fine time for him to be taking his afternoon nap! 6:44, so April and Tom are solely responsible for the kill coyote contract ? Why sure, dummie. Why is it so many Chandler and Harbicht supporters are so incredibly ignorant? I’m waiting 4:07, you whoooo. If you are refering to Mr. Chandler, yes he was on Council. He votes to allow the cell tower and votes to allow the circular driveway. Mr. Chandler did vote to trap the animals. When the law suit came he tried to settle but guess who wants to fight? Per tonight’s Arcadia council meeting, there has apparently been a replacement on the council. The new member is Tom Becker. I don’t know much about him but he looks like he knows what he’s doing. Some of those commenters at tonight's Arcadia City Council meeting are not digging on the American free press. A sobering reminder of how reactionary Republicans like Harbicht and Chandler have lined up with haters of our freedom. Do Asians find it offensive that Tay said tonight “Asians don’t like to get up early”? Let me help you: that’s called a generalization and is wrong. The man is really terrible. 8:38: In what context when Tay made that statement that "Asians don't like to get up early?" I like to know why he said that. Sho is planning to sleep in tomorrow. These meeting really knock him out. He was referring to how there is currently “coffee with a cop” meetings that he said are too early for Asians. So, he said there is now a later “dim sum with a detective” that starts later in the day. I see many of my Asian neighbors up eartly. Yet another example of him always having to bring up race. Not a very smart man. It is always sad to see the owner of a gun shop shoot himself in the foot. The fact is that most Asians get up very early to go to work and/or exercise. The politician Tay has to bring race into the picture because he says he represents Asians and he needs the Asian voting block. If he is sincere about helping the Asian community then he should promote hiring more Asian police officers to a City with 60%+ Asians. But he does not have the balls to stand up to the APOA. So he comes up with this "dim sum with a detective" diversion pretending that he is helping the Asians. Once again the mindless make it clear who they are. The purpose of "dim sum" was to raise money for the police foundation, which has nothing to do with the APOA or its membership. No one promised anyone anything. Try to keep your rants based in some level of fact. 5:28: Sure, they are set up as separate entities, but The Police Foundation, Acadia Police Dept, and APOA are all interconnected eco-system. Okay, you tell me the facts: How many police officers are Asians in the APD? "YES" on all of your 7 Points 8:24 am and there are many more reasons why Jolly Wu should be elected to CC. She is an energetic "breath of fresh air" that does not ask or receive money from anyone to run her campaign. Honest with Integrity. Roger chandler is Arcadia!!!! Without him is like Disneyland without Walt!!! !